Help! My Digger Disks Won't Work on My New Computer!! “Arrgh help! My Digger disks won’t work on my new computer. What can I do?” This is something I’ve heard many, many times over the past few years. Actually ever since Windows 7 was released. With Windows 7 the software changed, but the Digger disks were never updated to cope with this, or with Windows 8. And they have always had issues with 64-bit systems, although 32-bit ones seemed fine. There have been some round-about work-arounds. But seriously, for most of them you’d need to be an IT technical engineer to get it up and running. At least until now! UPDATE September 2017 – please read Help My Digger Disks Won’t Work on My New Computer – AGAIN! Peppermint Fence have created a program called BDM Revival which you can download. The sole purpose of this program is for you to be able to read your old DOS and Digger CDs on newer computers (64-bit ones included). Sounding good? Well it is, so don’t throw out your old BDM CDs just yet (like you would anyway), because if you download a copy of BDM Revival which will simply set you back a whopping (just joking) $19.99, and yet it allows you to continue using your precious BDM disks. So for under $20.00 you can still have access to your CDs. Note: for libraries and organisatations they do offer a library price. Basically BDM Revival comes with two ways to install it: “supported” (with CD) and “custom” (without CD). If you still have your original DOS or Digger CDs you can use them with the BDM Revival ‘supported’ installer. This will copy the contents of the CD to the hard drive, and then the CD can be stored away for safe keeping. For users who have already installed the original CD on to their old computer and may no longer have access to that CD (e.g. or have misplaced it), you just need to copy all the files (program and data) over to your new PC and use BDM Revival to create a ‘custom’ application – every one of these is different, and probably for more advanced users. The BDM Revival software knows how to fool the Digger app into thinking it is accessing an actual CD – this is why BDM Revival users are able to work without the CD being present. This is possible to do in a ‘custom’ application, but you have know exactly which files to tweak. The download is only usable on one computer, so if you wish to use it on two, you’ll need to download another copy for your other computer. Each computer can then read whatever DOS or Digger CDs have from those listed above. There is a library edition specifically for public installation such as libraries – see the website. I keep a Virtual Machine running XP setup in order to use any old Genealogy discs like my Digger ones – This looks better.. Thank heavens! It will be well worth while to buy 2 copies, one for my Win 7 machine and another for Win 8. I have the disks installed on 32-bit Vista w/o a problem. I fact I may buy 3, just in case! BDM Revival is great…… I also bout BDM Data Viewer prior to Revival …. I have another couple of cd’s so have asked if they can be added. I found my Digger CD S.A. Deaths 1916 – 1972 would not work on Widows 64 bit and it is not supported by BMD revival app. Hoping this one will be added to the list in the near future. Dear Jason, I am in possession of some Digger BDM disks that I think I need your help with. I am using Windows Vista on my computer. Can you help? 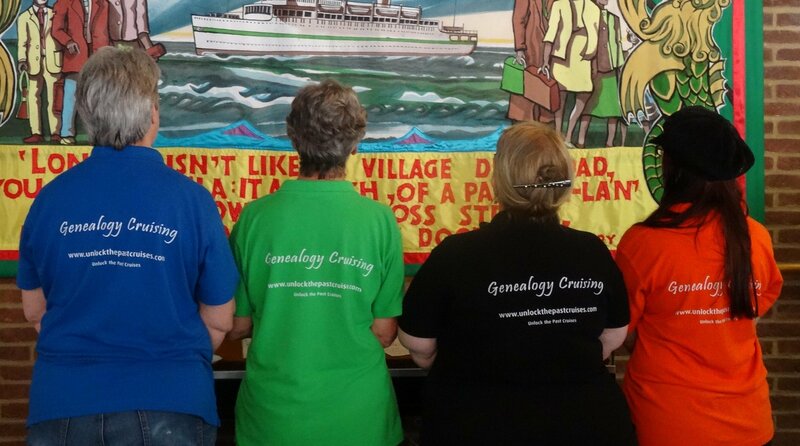 I got your name from Vicki Smith at her Geenie’s group in Geelong. I live in Lara.. I beliieve the cost is $20.00 Yours sincerely, Jennifer Bennett. Hi I bought BDM Revival and it works well however I am having trouble with the digger SA Births 1842 – 1906. It won’t load and I keep getting an “Illegal command : SAB1.BAT.” Does anyone have any suggestions? Hi Kerry, I’d be getting back on to the guys at Peppermint Fence to see if they’ve heard of others who’ve had issues where their program not working with that CD, and what can be done to fix it. How do I get a download of the BDM Revival for my diggers cd’s and pay for it please? Pauline, you can find it here: http://www.peppermintfence.com/BDMRevival.htm. Is DOS the only way the digger CDs can be converted? 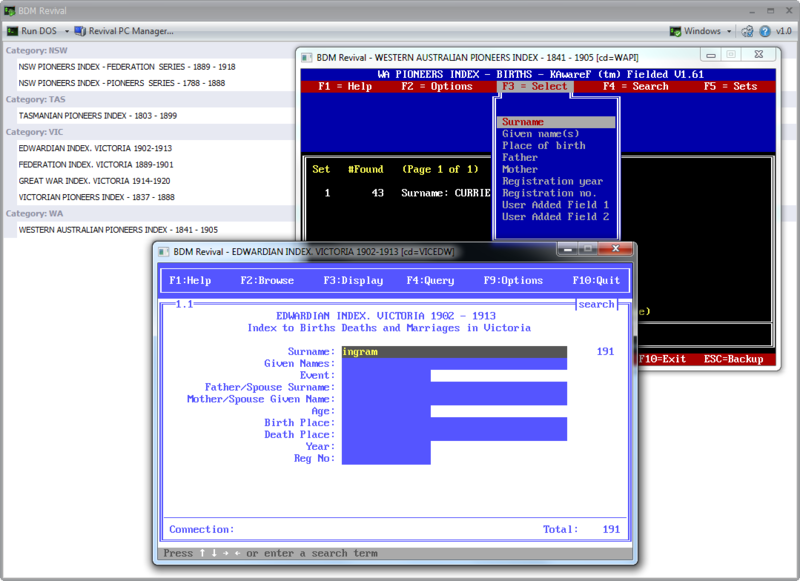 I do have the DOS versions of NSW but Tas and Vic arn’t .. At least there is a part solution the problem. Will the Digger discs work with Windows 10 (64bit)? If not what do I need to do? Hi Richard, your Digger disks won’t work in a Win 10 computer, so you will need to get the download program listed here from Peppermint Fence to make them work. Hi Michael, Sorry BDM Revival doesn’t work with your Vital Records CDs. The only way I can think of that should work, would be to buy Windows Emulation software which will make your computer think that it is an XP machine. Incidentally this method should also work for the Digger disks. Carol, if you still wish to use your disks, it’s the only way to. 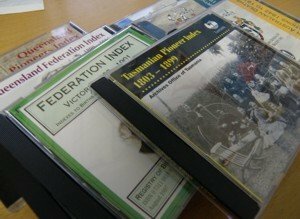 Other than that subscribe to Findmypast.com.au or become a member of GenealogySA as they have the same info that’s on the Digger CDs, but neither are searchable quite the same way unfortunately. Hi Alona, I note that the last Digger SA Deaths CD (1916-1972) is not listed on the Peppermint Fence list. Do you have a suggestion on a program that would read and/or install that CD on Win10 computer. I do have an old laptop that still reads all the Digger CDs but I ‘m wanting to pension it off! Hi Daryl, yes there is 1 SA Digger CD, and 1 Tasmanian one that aren’t covered by BDM Revival, presumably because they had licence code installation system. Anyway the only I have heard that others have got these ones working is to buy Windows emulation software which then makes your computer think that it’s an older version of Windows. And it works for the other Digger disks too. I hope that helps. Seems inflation has hit and the software now costs $30- USD to convert your existing, supported disks. Good news is that indexes that you don’t have can be purchased for the measely sum of $10- USD ea. It appears from the website that this will supply a working “DOS” version of the indexes for your 64 bit machine. This is a bargain considering the Digger CD’s cost well over $100- each. Leads me to wonder at the legality ? Clarification would be nice. I thought that I had found a solution to opening my Victorian BDM Cd’s that I had bought from you previously. You quoted a site called Peppermint fence on your site. However when I tried to access this site I found that the site has been suspended. Hi Guys, Is there any update on the question from Ian about Peppermint Fence? The site is no longer available. Hi Clyde, Sorry I haven’t heard anything more about Peppermint Fence. But as you know their website is down, and looks like it’s been taken offline. The only other alternative I know that others have done to get their Digger disks working is get some emulation software to make your newer computer think that it is a Windows XP machine.